Orcas Versus Great White Sharks: A Perennial Battle Of Predators - We Love Sharks! Orcas Versus Great White Sharks: A Perennial Battle Of Predators - We Love Sharks! The orcas versus great white sharks battle is one that happens often. It’s largely because in many parts of the world, orcas and the great whites swim and hunt in the same waters. So what happens when you have the two apex predators in the same space? Not many good things apparently, especially for the great white shark. Eye-witness accounts and wildlife videos show how orcas are able to overpower and kill great whites so quickly. For instance, as far back as 2012, wildlife watchers on a boat sailing near the Farallon Islands off the coast of San Francisco were stunned at the ferocious and swift attack pattern displayed by an orca against a great white shark. According to witnesses, the shark put up very little resistance as the orca rammed it at top speed to stun it. The killer whale then flipped it upside down and drowned it quickly. Thereafter, it began tearing the shark apart in large chunks and eating it. Such attacks are not very common but they do happen mainly underwater away from prying human eyes. However, another recent wave of orca attacks on great whites has shark lovers and marine biologists worried. Especially considering the fact that the conservation status of great whites is vulnerable. Here’s the information we have on the latest orcas versus great white sharks clashes. The months of February and May 2017 have witnessed what seems to be an abnormally high number of great white shark deaths within a short interval. Specifically, the carcasses of two great white sharks have been washed ashore on the same beach in Franskraal, Gansbaai South Africa within a space of a few days. The toll so far is three confirmed dead great whites and another two reported sightings where the carcasses were not found. The most recent carcass was found just five days ago and the dead shark was a 4.9 meter female with an estimated weight of 1,110 kg. It was of reproductive age and it had a large gaping wound on its underside. Also, the shark’s liver had been removed. Though, when there are other prey available orcas will prefer to hunt other blubber-rich sea animals than attack sharks. But sharks have a tasty organ that is obviously attracting these orcas; their very large, iron-rich, oily, and nutrient dense livers. The livers of all the carcasses were removed with a ‘surgical precision’ according to Alison Towner, a biologist with the Dyer Island Conservation Trust. In addition, the heart of one of the great whites was missing. All indications point to the orcas as the predators here. The immediate fallout of this phenomenon is that sharks are generally avoiding the area now. Within a 2-week period, tour boats have struggled to sight any sharks at all. The Gansaabi area ranks as one of the top shark-diving destinations worldwide and people come specifically to see the great white sharks in their element. Hopefully, the great white sharks have not abandoned the area for good. Orcas Versus Great White Sharks: Why Are Orcas Winning? Let’s look at a graphical comparison of the distinguishing features and characteristics of both animals and some quick facts so we can understand better what’s going on here. 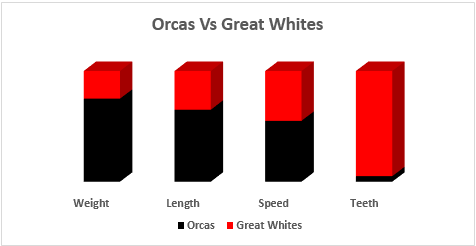 Just by looking at the above column chart you can already see why orcas would have an upper hand in a face-off with great white sharks. A few quick facts about the Great White Shark (Carcharodon Carcharias). – Females are generally larger but adult sharks generally range from 3.5 meters to a maximum length of 6.5 meters. – They weigh about 1,000 kg. Rarely some individuals may weigh up to 2,200 kg. – Pursuit swimming speed can go up to 35 to 40 km/h. – With an impressive array of about 3,000 razor-sharp, triangular-shaped teeth, and an excellent sense of smell, they prey on big fish, seals, sea lions, dolphins, turtles, seabirds, and even smaller great whites. – They are solitary hunters and usually ambush prey from below with a powerful and stunning surge. You can read more details about this species of shark at The Great White Shark. A few quick facts about the Orcas (Orcinus orca). 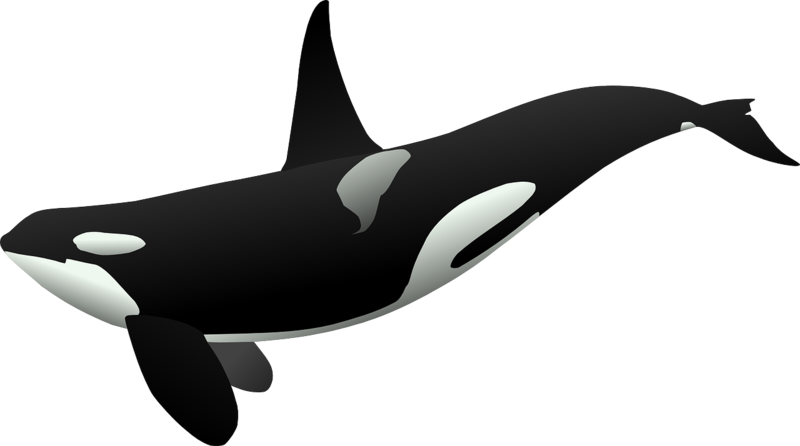 The orca or killer whale is a toothed, large-sized, black-and-white whale that belongs to the oceanic dolphin family. – Adult males grow up to 9.5 meters, adult females 8.2 meters. – They weigh from 3,600 kg to 5,600 kg. – Pursuit swimming speed is up to 50 km/h. – Orcas have 40 to 52 large, conical-shaped, inward-curving teeth in their upper and lower jaws. – They feed mostly on large fish and squid, other marine mammals, seabirds, and grey whale calves. Daily food consumption can go as high as 200 kg of food daily. – Killer whales hunt in teams (pods). Their preferred technique is to isolate individual prey before striking. Yes. The great whites have much more teeth than orcas. And yes, they are aggressive and skilled hunters built for the kill. But orcas are much bigger and slightly faster than great whites. But most of all, great whites hunt alone while orcas hunt in groups. Make no mistake about it orcas have relentless, intelligent, and ferocious attacking skills. In fact, killer whales are so fierce that they are called ballena asesina (assassin whale) by the Spanish. Once they spot a prey, no matter how large it is, such prey has very little chance of escape. We hope this recent spate of attacks on great white sharks is short-lived because a solitary great white shark will usually stand no chance against a group of orcas, or even against just one orca. After all, they are called ‘killer whales’ for a reason.